As the leader in the climbing wall industry, Nicros is pleased to offer the Nicros Comprehensive Inspection Program. Listed below you will find a brief description of the services included with a typical inspection package. Auto Belays. All automatic belay devices, components, and procedures shall be inspected to ensure devices are free from defects, excessive wear, and obvious signs of damage. Climbing wall inspection will also verify that all units are being used properly and in accordance with manufacturer specifications. Operations. Typical inspection shall include a review of all operations manuals, staff training plan, and maintenance documentation to ensure that minimally accepted standards, policies, and procedures are in place. Structural Inspection. 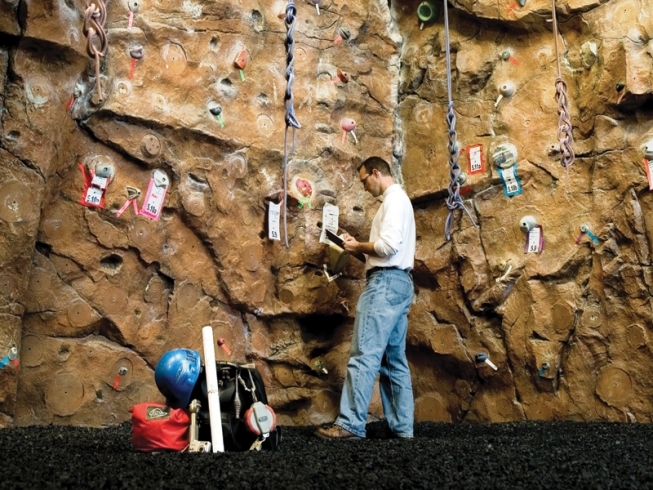 Climbing wall inspection shall include a visual inspection of all protection anchors, building connections, fracture critical members of support structure, as well as the structural integrity of the climbing surface. Landing Surface. Inspection shall include a cursory review of the climbing wall landing surface(s) to identify potential concerns that should be addressed to help ensure the safety of all climbing wall patrons. Please contact a Nicros sales representative at 800-699-1975 for additional information on inspection services and pricing information.